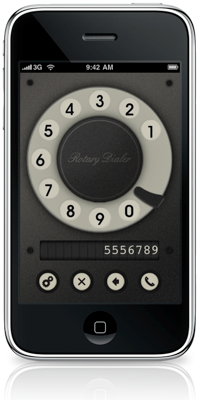 Rotary Dialer is a retro-themed rotary dialer for the iPhone. In addition to normal real phone calls, Rotary Dialer now supports dialing with Skype. That means iPod Touch and iPad users can use Rotary Dialer too! If you like the new version, then please leave a comment on iTunes so everyone will know how you feel. If you have problems or questions please contact me for assistance. Q: How do I get the old theme back? A: Press the gear button and choose “Original”. Q: Why don’t I hear any sounds? A: Check the vibrate switch and volume on your device. Also press the gear button and make sure sound is enabled. Q: Why doesn’t it sound like a real phone? A: Actually it does. I recorded the sound from a real rotary dial telephone (the same one that I photographed for the “Original” bakelite theme) using a high quality microphone. Q: Why is there a backspace button? A: A real rotary phone doesn’t have one, but so many people contacted me asking for a backspace that I caved in and added it. Q: Can I change the number printed on the old bakelite dial? A: I hope to add this feature one day. It will be tricky to get the font just right. Q: How can I dial a + sign? A: A helpful user told me that 00 works almost everywhere apart from the States and couple of other countries. Q: Did you make this for fun? A: Yes. I have quite enjoyed the fan mail and news coverage. Reboot your iPhone by holding the top power button and home button at the same time for a few seconds. 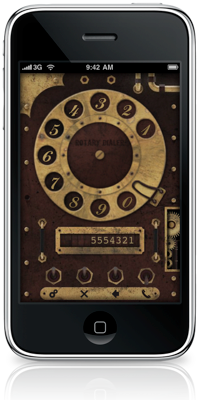 Try launching Rotary Dialer again. Delete Rotary Dialer by holding the home button, then pressing the little X next to Rotary Dialer. Download Rotary Dialer from iTunes again. It will say “You have already purchased this application.” and will let you download it again for free. If that still doesn’t work, then please contact me for assistance. 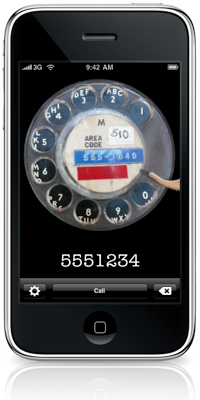 For help with Rotary Dialer for the iPhone, please feel free to contact me directly.